Despite a wealth if premier league talent and familiar names to us, Yaya Toure, Wilfred Bony, Tiote, Gervinho and talking of premier league talent Manchester Uniteds very own Howard Webb was refereeing the game. An early Colombia chance fell to Gutierrez but he must of known he was offside because he scuffed the chance. Ivory Coast haven’t kept a clean sheet in nearly a year so someone needed score at some point. It was a goalless 1st half but we did see the best most ridiculous dive ever from Serey Die, he kind of tripped himself up but went down as if he’d been stung in the face by a bee! Colombia went 1-0 up a corner 66min, it was poor marking, simple. Ivory Coast threatened for 5 mins they hit a corner into the 1st man (criminal) which they cleared easily. Shortly after it was 2-0 as Serey Die couldn’t control a 5 yard pass and gave it straight to Cuadrado who was 3 on 1. He slipped it to Rodriguez who slotted home. Yaya the tank now has to carry the team which looked like a heavy shift to carry through. Gervinho smashed home a great individual goal which will leave Arsenal fans rubbing their eyes in disbelief to give them hope but they failed to equalise and it stayed as it was. Despite having a Pass completion 70% which was 15%better than Uruguay in the 1st half they still went into the break 1-0 down. Suarez picked himself and his teeth up, wandered into the box behind Cahill. Cavani must have had awful breath as Johnson have him 3 yards of space, he had time to pick out the half fit genius Suarez to head past Joe Hart. Uruguay played more long ball than England and not one of them was successful. So surely the trick is to Keep pressure high on the pitch and keep their long ball completion at 0%?? Sturridge done some nice trickery on the right wing took out 2 defenders and put Johnson down the wing to put a low cross/tackle into the box that found it’s way to Rooney who ghosted into the far post for his first ever World Cup goal. 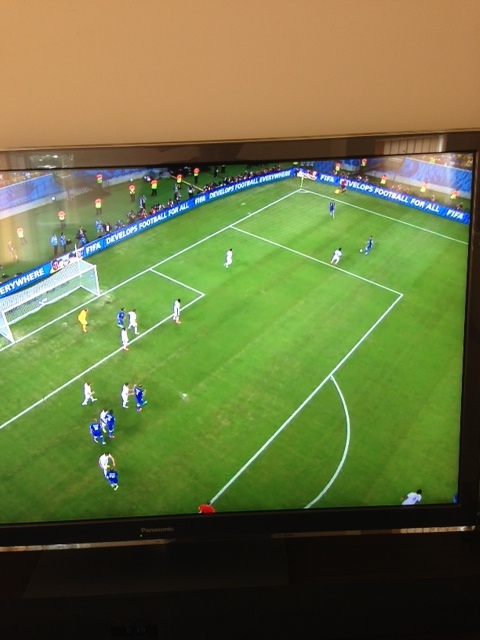 To be fair and despite the euphoria of an equaliser, England never looked close to winning it even at 1-1. 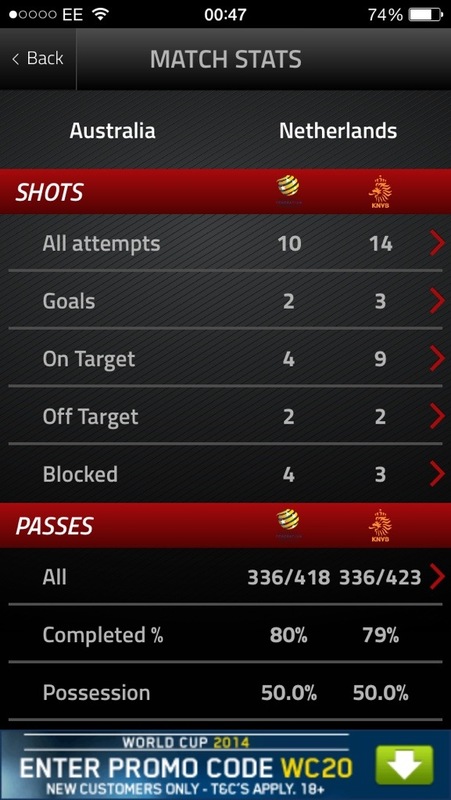 Passes were too short, too long, bobbly, or at an opposing player. Uruguay were like a bully in the playground, almost invited us in as if to say ‘come on then try and punch me, we got the hardest kid in the playground’! Queue Luis Suarez, for the sucker lunch! Again! Just when they needed him to step in, defence too deep one 5yrd run from Cavanai without even touching the ball, made Gerrard attack it but mis-judge and Jagielka pull forward 4 yards, giving Suarez the space he needs to smash past joe hart! Looking back it could have been avoided in so many ways. Fingers being pointed all over the place but realistically we lost against 2 teams that are above us in the world rankings. The frustrating thing is if we swapped both performances around from Saturday we would be sitting on 3 points. I refuse to point the blame on any one or two players we played out strongest team, but it’s just not good enough. So on goes the debate about youth/grassroots/overpaid etc. The facts are the money is the pressure on premier league managers so much so that a long term plan just can’t exist. There’s too much at risk. The other fact is although the fat lady is warming up her vocal cords she’s not ready to belt out a tune just yet. Italy win tomorrow and it will be time to leave work early on Tuesday and do the same thing again! 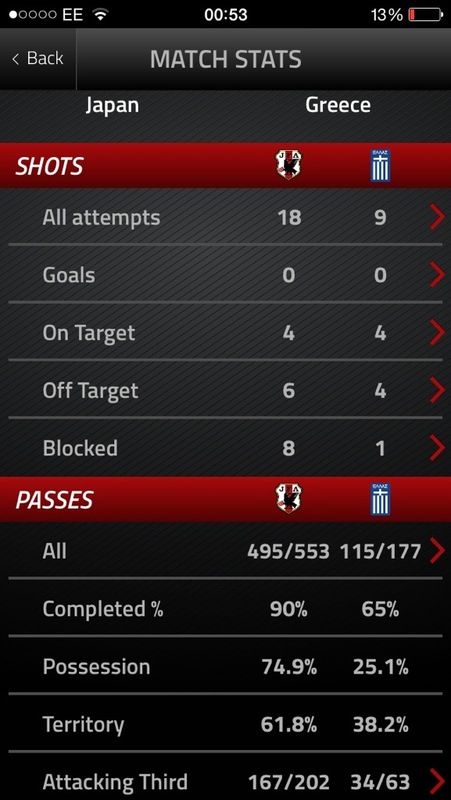 Game started, Greece has a player sent off, managed just 25% possession. Japan didn’t score neither did Greece. Stayed 0-0 but who cares! England lost again! World Cup Report Wednesday 18th June. England Problems? Easy to Fix? England Problems? Easy to Fix?. England 1 – 2 Italy 1st Group game in Manaus. England started very well so well in fact that most of the country were up celebrating when Sterling on his first competitive start for England done what he was paid to do picked the ball up on the half way line glided forward 17 yards and drove the ball what looked like into the near top corner from 25 yards, it was the perfect start we thought as we bounced around the room embracing each other in celebration…….that was until we realized the team were not as excited as we as fans were. That was because it hit the side netting. As the world cup has continued I’ve noticed this has happened more and more, FIFA please tighten the nets to save us from any more embarrassing embraces with friends and family. 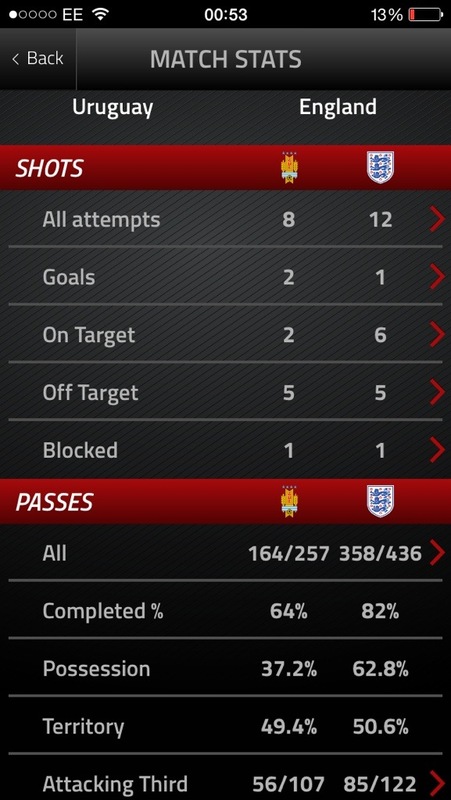 As the stats show this game set records in pass completion during a world cup with Italy 93% Eng 91%. Something England supporters have been crying out for the last 4 years. With Rooney and Baines on the left whether or not it was a deliberate ploy by the italians the only crosses they made in the whole game were from their right hand side. 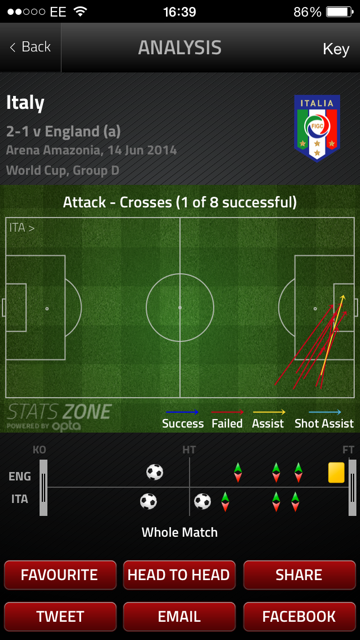 All 8 crosses were hit withing the same 10 yards as we know 1 of them good enough to find Ballotelli to score. With Sterling potentially being pushed out left side on Thursday despite the belief of some pundits he would provide quicker and better cover for Baines than Rooney, who can be susceptible to Roam too much to have to rely upon when we need to defend. The first goal was cause because of England over indulgence on defending. As we are taught through the ranks “bodies behind the ball” We did this on the corner that led to the goal, with 3 men in the box not marking anyone. Baines near post, then runs out to the short corner, Sterling on the 6 yard box runs out to cut out the receiver from the short corner, that left Rooney and Welbeck on the 6 yard box doing nothing, Pirlo threw the dummy with Sturridge closing him down, that left Marchisio with no one within 5 yards of him. If Sturridge was on the half way line then no defence would have left 1 v 1 on their own corner so that would have taken Marchisio out of the frame. Rooney marking Pirlo, Welbeck marking Verratti who gave the assist. The Italians had 4 players in the box, we had 9!! This happened twice in the game the second occasion we were lucky enough to get away with it. I hope we learn from that and don’t just assume that empty space in the box will score. As far as attacking intent goes, Italy only took it past an England player 4 times in the whole game compared to England’s 12. But of course with Pirlo in the team making 103 successful passes maybe you don’t have to. Di Rossi and Pirlo had far too much control of the midfield with 50 passes to and from each other, compared to Henderson and Gerrard sharing just 5! With Gerrard deciding to send the ball wide to our fullbacks 28 times trying to keep the ball away from the italian midfield. There’s plenty of suggestion to play different personel for the Uruguay game, but realistically its more likely to be a change in positions than players. No matter what happens, they’ll be screaming, cheering, swearing at the screen from 8 till 9.50pm uk time tonight. All you can do is enjoy! The most colourful of games in many ways with the orange of the dutch (even though they were wearing blue) pretty much sent the yellow and green of Australia back down under despite looking the better team on the pitch and on the scoreboard for 65mins. That was the turning point, Aussies were 2 on 1 against the keeper but Oar smashed it across goal and probably broke 2 of Leckie’s ribs in the process as he could do no more than chest it towards goal. The Dutch went and scored from 25 yards at the other end! That was the difference! Get the shrimps out, the Roo’s are coming home! Oh and must mention Tim Cahill’s opener, best goal of the tournament so far! Spain losing 2 consecutive internationals for the 1st time since 2006 proved costly! 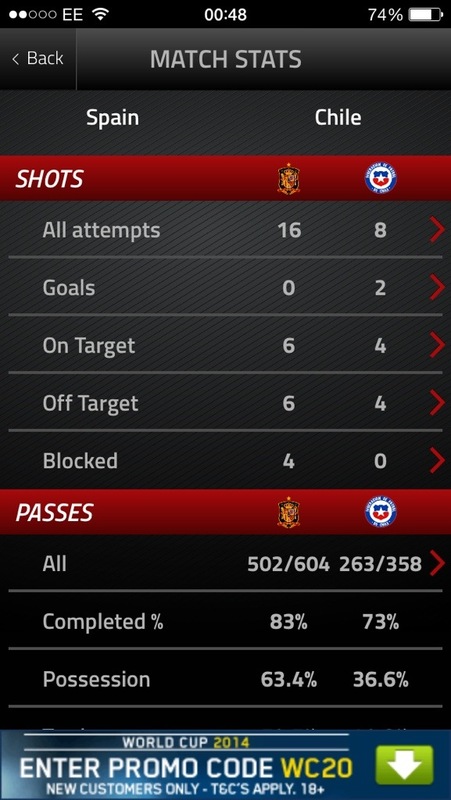 Alonso given the ball away was the story of the 1st half resulting in Chile taking an early lead on the break in 20mins. Spain continued to try and play but looking like they were trying to solve a puzzle with only half the pieces. Then Alexis’ free kick From 22y scared Casillas so much he decided to punch it straight to Aranguiz instead of dirtying the palms of his gloves, he punished him by ramming the ball down his throat and into the net. 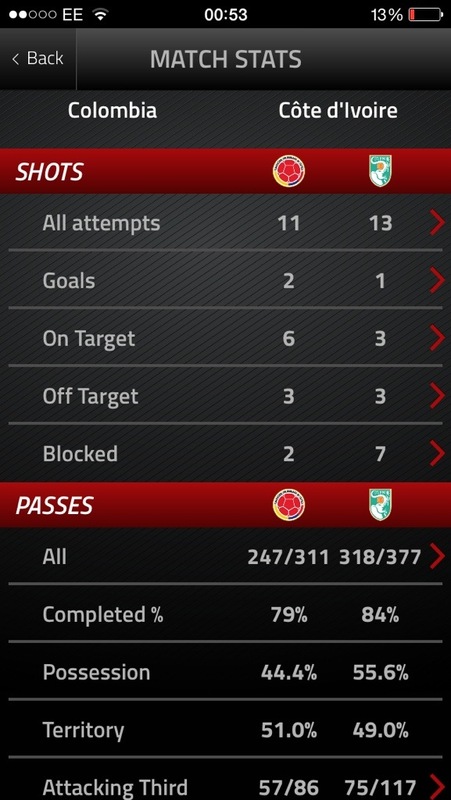 2nd half began Spain huffed n puffed but couldn’t have blown each other let alone a house or the chile defence down! Spain were so bad in the 2nd I’m beginning to believe in match fixing! Most of the Cameroon squad will struggle to sleep tonight but it’s because of the itches on the pitch in Croatian shirts rather than than from creepy crawly’s in the amazon city of Manaus. 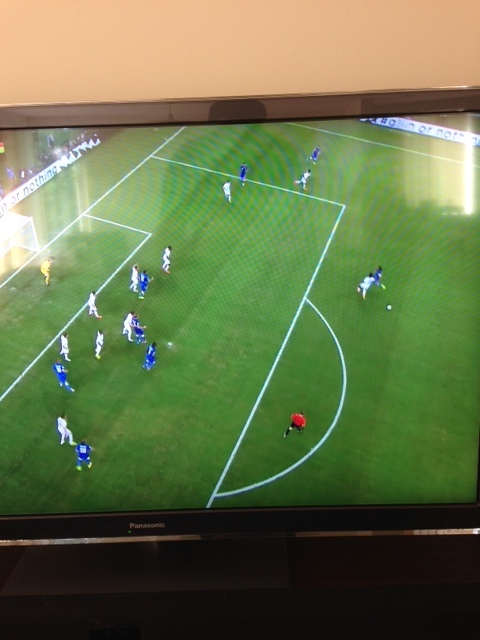 With Perisic setting up Olic for the 1st goal after 20m the tone was set. Alex song sent off in late in the 1st half for a bitchy elbow chop down a spine reminiscent of an 90’s wrestler and ruined the game for his hard working Cameroon buddies! Rakitic and Modric had a free reign to dictate the game after that. Perisic got the 2nd just minutes into the 2nd half after the Cameroon keeper Itandje caught a bout of floppy ankle and kicked it straight to the Croatian winger, he ran in on goal for 25 yards and Itandje not content with passing it straight to winger dived out the way of the placed shot to make it 2-0. Mandzukich made 3 when Cameroon defenders decided it would be more fun marking grass than players from a corner, then a 4th thanks to the Cameroon keeper Itandje continued to play kamikaze keeper with his second assist of the night by palming an angled shot into Mandzukich’s feet. The rest petered out into a non event, despite Cameroon hitting the crossbar. 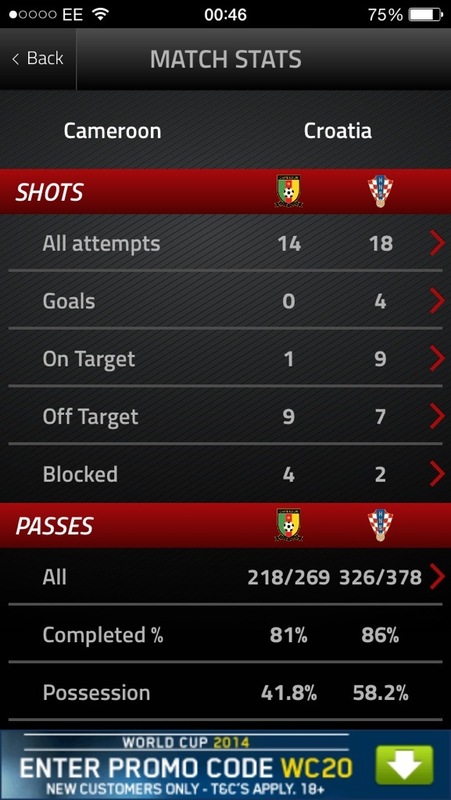 Croatia looked decent but Cameroon beat themselves, rather than got beat!